Hello Kitty History – but wait, who’s saying she’s not a cat? Well, she’s supposed to be a cute white cat created by Sanrio Company, Ltd., and she conquered the world with her kawaii styles of Japanese pop culture. She was worth $7 billion a year by 2014 at the age of 40… Back to the first question, is she a cat or what? Her full name is Kitty White, who used to be the white kitten with no name . Why she was born, the reason is Snoopy . Snoopy is Charlie Brown’s pet beagle in the comic Peanuts by Charles M. Schulz. Sanrio was selling Snoopy products and they wanted to produce their original character. Yuko Shimizu designed the original Hello Kitty and it was one of the characters which were produced in Sanrio back then. To answer the question whether she is a cat or not, it is a ‘PERSONIFIED CAT’ so Sanrio claimed. Not just simply a cat or 100 % human. You never see her on all fours, right? Hello Kitty is Hello Kitty just like Centaurs is Centaurs. Not a good example? Well. Originally it was marketed at young girls, but in the 1990s target market for Hello Kitty was broadened, the popularity spread among grown-up women. In the end, women are all grown-up girls , who would not love cuteness? According to Sanrio, in 1999 Hello Kitty appeared on 12,000 different products yearly. By 2008, Hello Kitty was responsible for half of Sanrio’s $1 billion revenue and there were over 50,000 different Hello Kitty branded products in more than 60 countries. The product range has expanded and goes all the way from dolls, stickers, greeting cards, clothes, accessories, school supplies and stationery to purses, toasters, televisions, other home appliances, massagers, and computer equipment. It’s not all, yet. You can see Hello Kitty on some bank cards, credit cards, and guitar, wine and jewelry, even on the aircraft! In July 2004, pet animals were very popular among young women, Charmmy the cat along with Sugar the hamster, were introduced in the market as Kitty’s pets. Just like her owner, Charmmy has no mouth. Some say its blank stare is their appeal so that they can project their own emotions. In Hello Kitty history, she is a unique character. Well, kitty owns a kitty. As long as they are cute, it ain’t matter. Little details about her personal history. She was born in the burbs of London, England, on November 1. Her height is described as five apples and her weight as three apples. Quite apples. Her head accounts for approximately half of her total body mass. She is portrayed as a bright and kind-hearted girl as she said on twitter You can never have too many friends! But why Londoner? It’s all about Japanese women/girls admiration for British culture at the time of its birth. Back in the 1970s, They adored British fashion, music and some characters as well. The books and illustrations of The Tale of Peter Rabbit by Beatrix Potter is a good example. Girl’s interest always inspires designers to create a new industry. 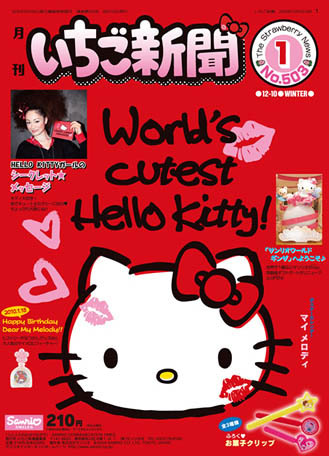 Did you know Sanrio publishes the newspaper every month since 1975? This paper shows you varieties of Sanrio characters and new products. The most popular content is a Popularity Vote for Characters which is held annually. Hello Kitty won the first prize through from 1998 to 2009 straight. This newspaper tells you Hello Kitty history and more of other Sanrio characters. Every girl was looking for the paper to be published and look what’s on the paper with a small free gift. As we have mentioned, you can see Hello Kitty on a variety of products. It ranges from mass market items to high-end consumer products and rare collectibles. Now, let’s get back to the basics. Let us introduce you the real cuteness of Hello Kitty which little girls (big girls, too) can buy for a few dollars. There’s a collection of local Hello Kitty key holders. Each 47 prefectures in Japan have its own Hello Kitty-designed products. They are so kawaii , its small size and affordable price should stimulate your collecting desires. Below is the example of capital area’s Hello Kitty and you can check all 47 prefectures’ local Hello Kitty. Kawaii rocks! You can meet all the adorable characters and get to know Hello Kitty history, see the cute parade and buy limited-edition products at Sanrio Puroland!